There is some wonderful bacon in the Chilebrown ice cave, just waiting to be unleashed for a wonderful lunch. This bacon from Schreiner’s will be used in our quesadilla filling and also the bacon drippings will be incorporated into our home made flour tortilla. Some grilled tomatillo salsa will top off our bacon creation. We fired up the grill and roasted some home grown vegetables. The tomatillos and tomato’s were provided by our neighbor James. When James is not growing killer vegetables, he is my partner in crime at the Chili competition. The peppers were from my pepper patch. 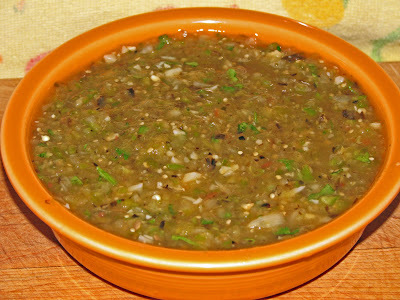 Grilled, spiced and blended made for one delicious salsa. 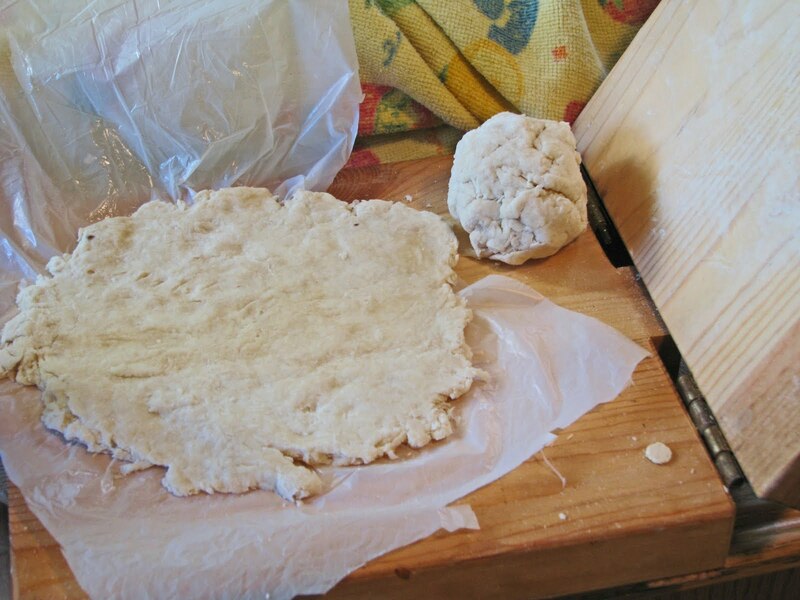 Flour tortillas are very simple to make. 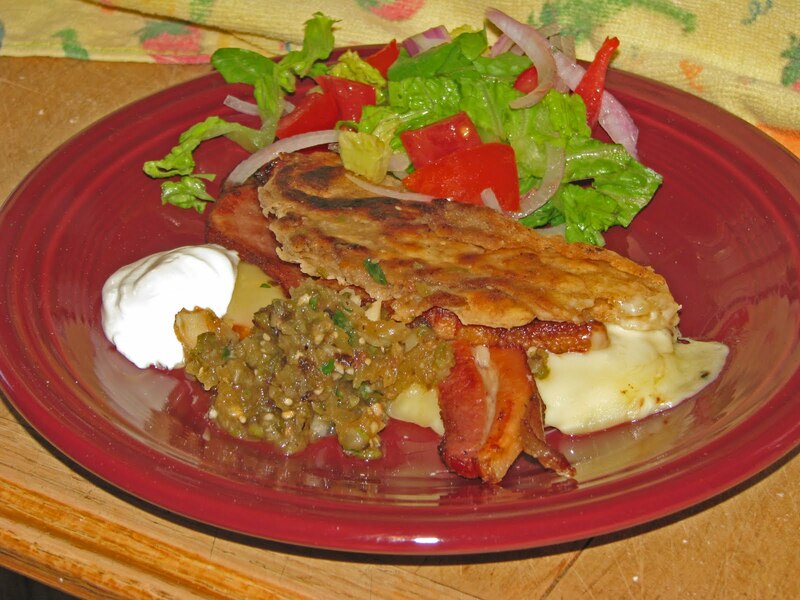 I substituted bacon fat for the shortening in this recipe. A tortilla press was used to flatten these discs of comfort before being cooked in a hot cast iron skillet. Combine all the ingredients and gently knead. Let rest for 15 minutes covered. Form into balls and flatten in tortilla press. (You can use a rolling pin). Cook on a non-greased hot skillet for 3 minutes a side. Jack cheese and bacon slices were the filling of our quesadilla. A green salad was added just for color and a little crunch. I do not know who said: “Everything tastes better with bacon”, but they were right. Man I wish I lived in your street...that salsa looks presidential! Wow, homemade tortillas. Beyond cool. FoodnessGracious, Stop on by sometime and we will have a presidential ball. Greg, Are you going to the Apple Festival tomorrow?. We are going to Occidental and Freestone afterwards. cookiecrumb, Thick, flaky and bacon flavor throughout. You can make them any thickness your heart desires or can handle. The salsa was deeeeeelicious!!! Only problem is that it is all gone! Presidentofcookies, The tomato's are almost ripe. You will soon have salsa galore. 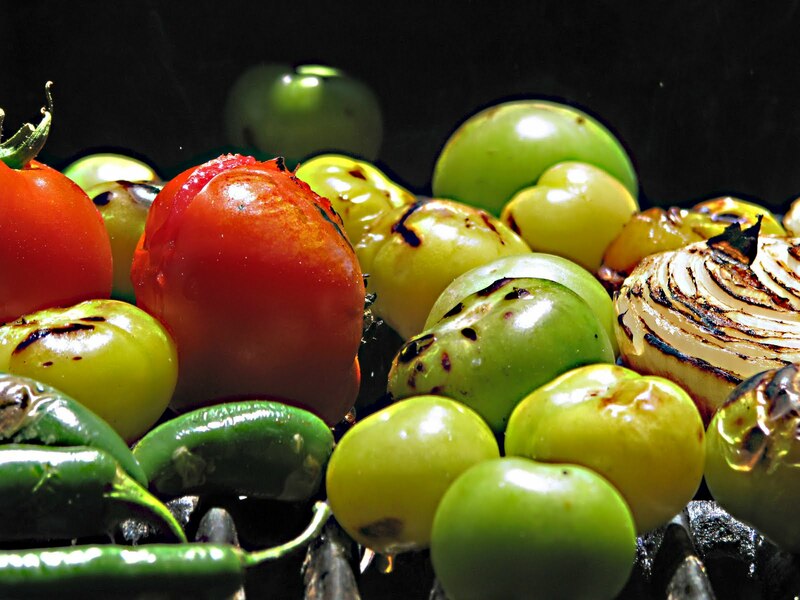 Fire roasted salsa is head and shoulders above regular salsa. Excellent looking meal! Loving all the peppers in this post and the salsa! yum!! !